Fairmount got its name from Arthur Edward Stilwell, the man who created Fairmount Park in 1892. In 1891 he built a streetcar line called the “Air Line,” which ran from Kansas City to Independence. To encourage people to ride his Air Line, Stilwell built the amusement park along the line. In 1892 the park was called Cusenbary Springs. 40 acres of J. D. Cusenbary’s land had been purchased, along with the spring which was dammed to create an 18-acre lake. That year the name was changed to Fairmount Park. It was likely named after the park in Philadelphia which had the same name, as Mr. Stilwell was actively courting investors from Pennsylvania to help finance his other projects. Arthur Stillwell was an entrepreneur who loved building streetcars and railroads. The Kansas City Southern Railroad was built by Stilwell, who has several cities named after him in states from here to the Gulf of Mexico. He created nearly 40 towns along the railroad lines he built, like Stilwell, Kansas and Port Arthur, Texas. Stilwell was one of Kansas City’s great civic leaders, and Fairmount Park was his playground. Tens of thousands of people a year came on the Air Line to enjoy a beach, amusement park rides, a zoo, vaudeville, dancing, daredevils, and it was known as the “Home of Picnics,” with some of Kansas City’s biggest companies treating their employees to a day at Fairmount Park. It was the home of the Kansas City Horse Show, which would later evolve into the American Royal. Arthur Stilwell was enjoying the Horse Show at Fairmount Park on September 11, 1897, when the last railroad spike was driven in Port Arthur, TX, for his Kansas City, Pittsburg & Gulf Railway, which connected Kansas City to the Gulf of Mexico. The next day a hurricane would tear through Port Arthur, killing 14 people. At the same time, yellow fever quarantine kept all railroad traffic from coming south of Shreveport. Within two years Arthur Stilwell lost control of his railroad to the Gulf of Mexico, which was taken from him by bankers over an unpaid $44 printing bill, and renamed the Kansas City Southern Railroad. He lost Fairmount Park in the bargain. Unbowed, Arthur Stilwell embarked on an even bigger project: connecting Kansas City with the Pacific Ocean. 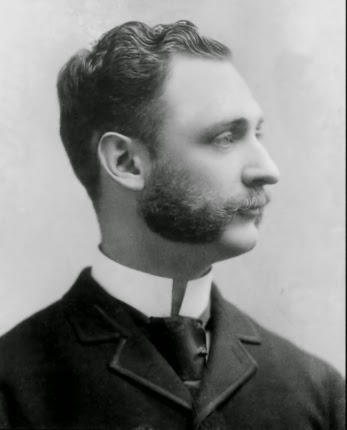 He began building the Kansas City, Mexico, and Orient Railway in 1900. Stilwell spent the next decade laying hundreds of miles of tracks throughout the Southwest and into Mexico, when the Mexican Revolution broke out in 1912. Once again his railroad went into receivership. Though he would lose everything, many of his investors became millionaires several times over when oil was discovered along the tracks of the railroad to the Pacific he tried to build. One of the biggest beneficiaries of the oil money was the Kemper family of Kansas City. After he lost the railroad, Arthur Stilwell spent his time living in New York City and wrote several books, poems, and hymns. He would claim that little pixies/faeries that he called “Brownies” had given him all of his ideas and inspirations. Stilwell was born in Rochester, New York on October 24, 1859. He married his childhood sweetheart, Jennie Wood, and brought her to Kansas City in 1979. He died of a stroke on September 26, 1928 in his apartment on 74th Street in New York. Two weeks later his despondent wife Jenny threw herself from the 14th story window of that same apartment and committed suicide.